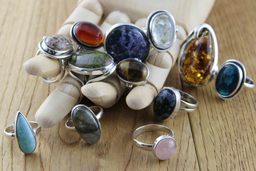 Outrage Jewellers offers a bespoke collection of carefully selected semi-precious stones made into handmade jewellery from around the world. The uniqueness of each piece depends on the individuality of each stone which is infinitely created by nature and can be seen through the huge variant of gemstones stocked, including Moonstone, Labradorite, Turquoise, Opals, Amber, Sapphires, Diamonds and many more. Outrage was established in Leeds 26 years ago as a family run venture with a passion for sourcing unique, natural and affordable jewellery, taking inspiration from experience of life in Kenya. They now pride themselves on delivering the highest quality materials in unique designs from their newly launched website as well as from their shop in The Leeds Corn Exchange.